Wooden peg-board (the kind you use to hang tools from in the garage) is a cheap and simple alternative to purchasing a multiplication board. 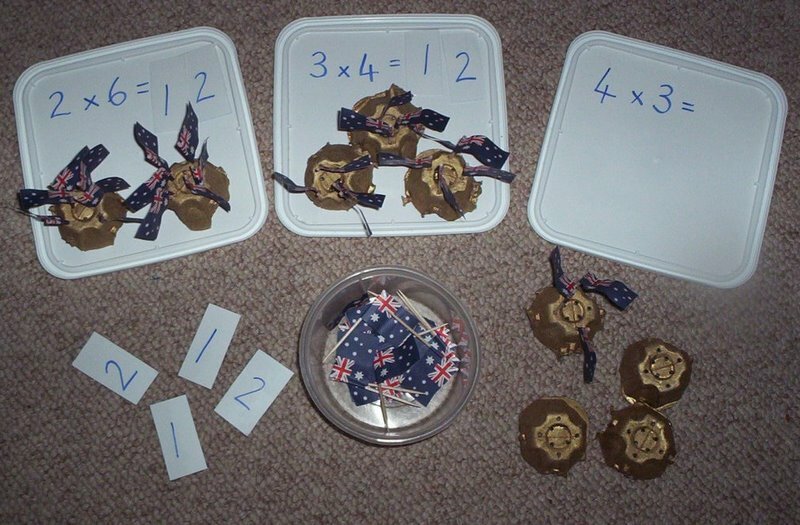 Continuing on with my mathematics tray ideas this week (introduction and addition trays here, subtraction trays here), here are some multiplication ideas for learning times tables. We made our own homemade Montessori multiplication board using pegboard wood for a cheap alternative. For another easier method using a rubber bath mat, see this post. While the Montessori multiplication boards are an excellent idea, my children found it quite tedious placing the beads into each little hole every time, preferring to use the blocks from our Math-U-See sets, MAB’s or other manipulatives instead. Whichever way you choose to present multiplication, make it visual, tactile and concrete to begin with, before moving to abstract concepts. The following tray ideas are for children who already understand the concept of multiplication and simply need some more practise of their basic facts (their times tables) in order to commit them to memory. Threading beads onto pipe cleaners (bend the ends to keep the beads from slipping off) is a home-made alternative to the Montessori bead materials. They become the manipulatives, with the multiplication problems written on popsicle sticks. The popsticks are laid out, making sure that the word “start” and all the answer sides are upright. The child turns over the “start” stick and uses the bead strings to solve the problem on the other side. They find the answer to that problem on the next stick and turn it over to reveal a new sum on the other side and continue on in the same way until they reach the “finish” stick. If at any time they turn over the finish stick before they have completed all the other sticks, it indicates they have made an error along the way. Wooden MAB’s (multi-based arithmetic blocks) are the “old fashioned” mathematics manipulative that I grew up with. They can be used in place of bead chains for many math concepts. Here they are set out for learning the 10 times table (multiplying by 10’s.) The sum is on the left and the small circles show a running total, with the large circle answer at the end of the chain. A small pad is included for recording the answers. 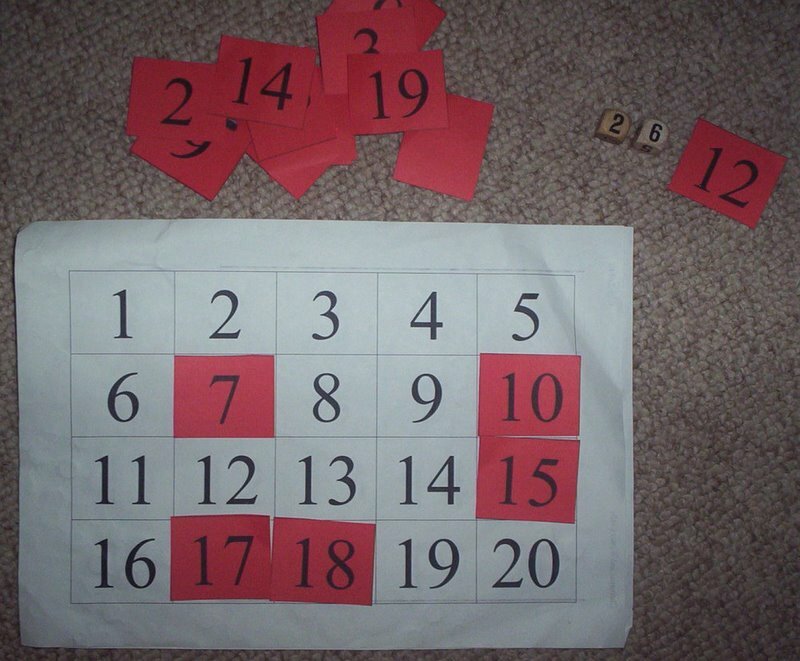 These plates are actually set up for skip counting in the photograph, however with the addition of some multiplication problems, lend themselves very well to practising times tables. Popsicle sticks with answers are matched to multiplication problems on an icecream container lid. Popsicle sticks with the problem are slid into slots with matching answers on the egg carton. Plastic balls with problems are matched to the answers in an iceblock tray. Pegs with problems are pegged on to the answer segment on the container, which doubles as a storage place. Dice are thrown (you need 3) to create any combination of addition, subtraction or multiplication problem and the answer is covered on the board. The idea is to continue until all answer squares have been covered. This is for children who already have a fairly good mastery of their basic number facts and tables. Each square container holds 4 little plastic shot glasses for practising the 4 times table. Jewels are counted into each glass and totalled to find the answers. A plastic lunchbox filled with pattipan answers to match problems on circle. The correct number of flags are inserted into the castles, with the castles showing how many groups. 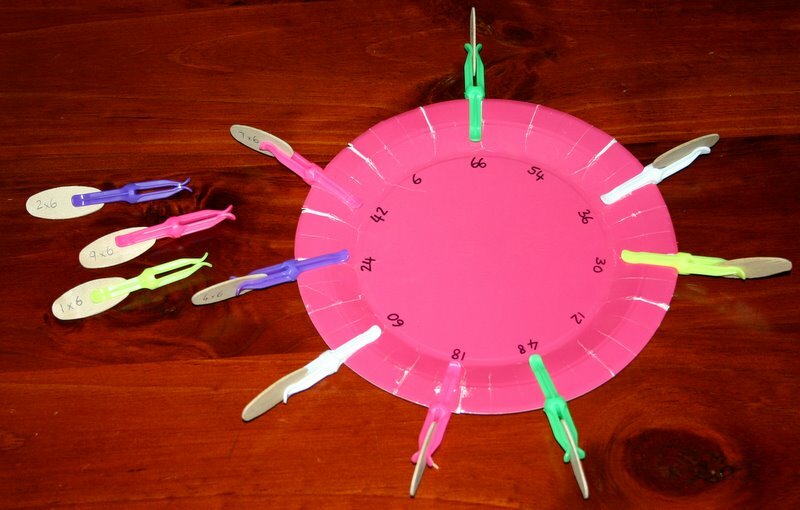 Pegs are slid on to the matching answers on the paper plates. A manipulative is needed for working out the problems unless the child is able to complete them mentally. 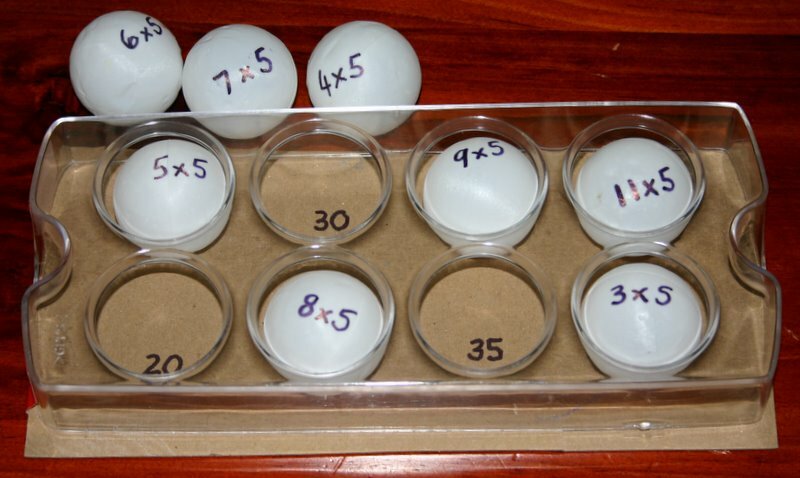 Ping pong ball problems are matched to the answers in an egg holder from the fridge.